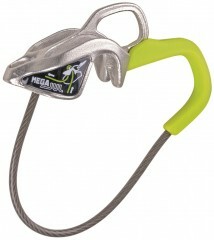 The Edelrid Mega Jul belay device is the big sister of the Micro Jul. Designed to work with bigger diameter ropes.the Mega Jul is a versatile belay and rappel device made of solid stainless steel for durability.The assisited braking thub loop (green covered section at the top give more control. The large steel loop attaches to anchors so the device can lock up without using a brake hand as your second top rope up to you.